Johnson Controls International, a global leader in car seat systems and components, interior fittings and electronics, recognised Omega’s achievements at the International Supplier Expectation Day and awarded the Diepholz-based company the Silver Europe Supplier Performance Award. Members of the Johnson Controls management team and representatives from the company’s community of over 1,200 suppliers assembled at a formal awards ceremony which was held at the Bay Arena in Leverkusen which is best known for hosting football matches. Johnson Controls used this event to present awards to representatives from the best of the best of their suppliers which included Walter D. Olbert, Managing Director of Omega Technology Plastic. The Diepholz-based company supplies Johnson Controls with specialised plastic components for car seats and car interiors. Johnson Controls in turn supplies the world’s leading car manufacturers and employs approximately 150,000 people who are located in manufacturing plants around the world. The company’s operations can only be successful with the help of first class suppliers. ‘This is a tough but fair competition in which the most important success factors are checked, monitored and rated in accordance with a points system that is applied across the world. 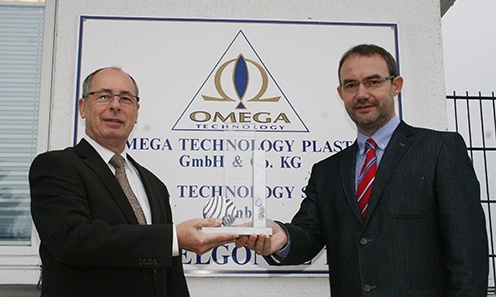 According to a press release issued by Omega Technology Plastic, the award winners were recognised for the extraordinary contributions they have made in categories such as quality, pricing systems, on-time delivery, service and sustainability. The Diepholz-based plastics engineering company and its 120 employees were recognised in the awards for delivering a high quality service. This is no mean feat for a medium-sized company that stands shoulder to shoulder with competition from across the world. This is why Managing Director Walter D. Olbert, Sales and Project Director Friedrich Kenneweg and his team are so delighted to have received the award which now occupies a place of honour in the company’s display cabinet at its premises in Ovelgönne in Diepholz. ‘A highly qualified team, a state-of-the-art machine park and the constant pursuit of excellence,’ is how Friedrich Kenneweg explains the company’s success. ‘It is especially fitting that the award ceremony took place in a football stadium which is where top Bundesliga professionals show off their skills.’ Managing Director Walter D. Olbert pointed out during a special ceremony that this success is not down to a matter of luck. He stated that it is based on the fact that working together is the only way to make things happen and that each individual makes a special contribution to the overall task. He highlighted the fact that this approach has certainly been successful at Omega. Mr Olbert thanked all the employees who could all be proud of the fact their efforts have been recognised by the company’s biggest customer.